All is set for the recommencement of the State Emergency Ambulance Service earlier stopped as it would afford Deltans and residents alike the opportunity to get ambulance service at just one telephone call during emergencies. 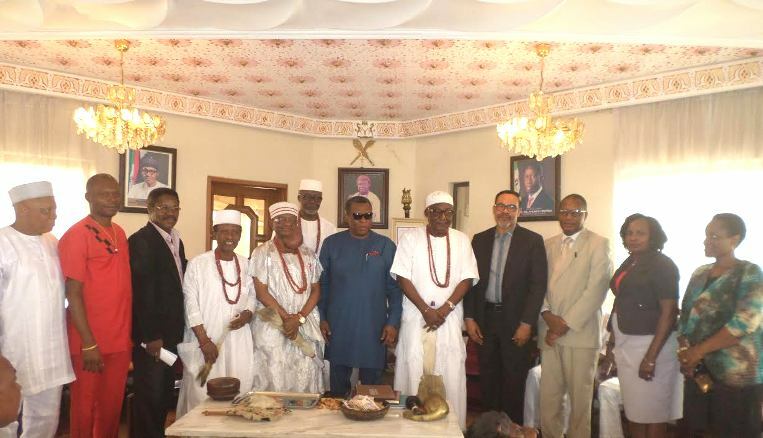 The Delta State Commissioner for Health Dr. Mordi Ononye made this known during his visit to the Palace of the Asagba to intimate the Monarch on his resumption as Commissioner for Health and also seek the cooperation of the Monarch as regards the health policies of the Governor Ifeanyi Okowa Administration. He informed the Monarch that this administration has embarked on many projects in Asaba and Oshimil South Local Government Area with the view to boosting the status of Asaba as a state capital and as such the Governor deserves the cooperation of the people to encourage him to do more for them. Dr. Ononye said one of the projects that have received His Excellencya��s attention and which he is committed to completing is the Asaba Central hospital which incidentally commenced in 2006 when Dr. Okowa was Commissioner for Health during the Chief Onanefe Iboria��s administration. He said the hospital which will be called Asaba Specialist Hospital will commence part services in April this year with the vital components that have so far been completed as this commencement will no doubt attract continuous government attention until full completion is achieved. Commissioner revealed that the Okwe General hospital will still be maintained and run as a General hospital. For easy access to the new hospital, Dr. Ononye said the State Executive Council has approved the construction of the road from Okpanam road to the new hospital including other peripheral roads within the hospital vicinity. He added that the Primary Health Care Centre located at Umuagu which has just been selected to participate in the Contributory Health Scheme will undergo an improvement to enable it provide the necessary services that its new status allows. Dr. Ononye mentioned other projects that the Okowa Administration has embarked on in Asaba includes the dualization of the stretch of road behind the Asaba Golf Course from Anwai road to join the hospital road, the on-going construction work going on at the Stadium complex, the furnishing of the office provided for the Nigeria Institute of Medical Research (NIMR) out station, completed roads at Cable amongst others. He reminded them that very soon Deltans will be going to the polls and urged them to use the ballot to give Governor Okowa a second tenure in office to enable him do more for the Asaba community, Oshimili South and the entire Delta State. Responding, the Asagba welcomed the Commissioner to the Palace and commended him for deeming it fit to visit the palace at such a time. The Asagba who was represented by the Iyase of Ahaba, Chief Patrick Onyeobi said that judging from Dr. Ononyea��s antecedence, he is sure he will do well in his new appointment and hence congratulated His Excellency Senator (Dr.) Ifeanyi Okowa the Governor for recognizing and rewarding excellence in appointing him as Commissioner for Health. He said he is not surprised at the projects the Governor has embarked on for the benefit of the people because he came on board with a planned programme which is the SMART Agenda and the results being churned out are the testimony of a good programme. The Asagba said that Asaba which is the capital of Delta State is the mirror through which visitors assess progress made by government and hence it is important for government to make Asaba a showcase of which they are convinced that he is doing very well. He requested this government to add to the list of good things it is doing for Asaba to build a public cemetery in Asaba to check the situation where households has become burial grounds with its attendant health hazards. The Asagba wished the Commissioner the best in his new appointment and assured him of the Palace firm support towards the utilization of the goals of the Governor Okowaa��s Administration and also urged the Public Servants who are the engine room of government to continue to do their best and take decisions that would be generally acceptable to the people. ← We understand that the key to creating great paper lies within outstanding communication between a Canadian writer and a client that helps avoiding revisions.